With the slightly surprising financial success of Spy Kids 3, Rodriguez has become a director with a good track record – at least as long as he continues to crank out the kiddie action fare. 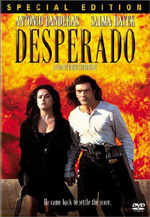 Rodriguez’s more adult-oriented material – 1995’s Desperado, 1996’s From Dusk Till Dawn - hasn’t done as nicely. While his debut feature didn’t make a boat of money, it did put Rodriguez on the map. He made 1993’s El Mariachi for a remarkably low budget of $7000. Rodriguez continues to shoot for much less money than pretty much anyone else; he’s wrapped each of the Spy Kids flicks for budgets in the mid-$30 million range, which is remarkable given the on-screen results. He’ll never touch the bargain basement nature of El Mariachi, though. El Mariachi brought Rodriguez to prominence partly due to its budget. Indeed, it’s almost impossible to believe this thing only cost $7000. Technically, it didn’t; the final product on the DVD got some post-production work that occurred after Columbia picked up the flick. However, that little layer of polish doesn’t alter the mind-bendingly cheap nature of the original production and the fact Rodriguez delivered so much for the money. Not that one should expect a terrifically professional affair. Mariachi definitely bears the scars of a low-budget film. The non-professional actors seem stiff and unconvincing at times, and the whole thing has the feel of a project made on the go. Those moments could become irritating, but the director only sporadically unleashes them, and the film’s general energy keeps things moving well. Rodriguez displays a great eye for action staging, and these pieces usually come across as exciting and creative. He also uses well placed humor to defuse – and occasionally extend – tension, such as during the chase sequence at the hotel. 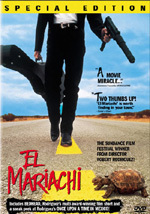 El Mariachi appears in an aspect ratio of approximately 1.85:1 on this single-sided, double-layered DVD; the image has been enhanced for 16X9 televisions. Due to budgetary issues, El Mariachi demonstrated a lot of iffy visuals, but it looked reasonably good given those restrictions. For the most part, the film showed the various issues often connected with 16mm movies. Sharpness usually looked pretty solid. Some of the shots came across as a bit soft and tentative, but most of the movie was acceptably detailed and distinctive. I saw no issues related to jagged edges or shimmering, but some mild edge enhancement seemed apparent at times. Print flaws were difficult to judge given the original material. Grain caused the highest level of distractions, but clearly those elements stemmed from the film stock. Some daylight scenes suffered from no problems in this realm at all, but others and the lower-light shots created a very grainy image. I also saw some specks occasionally, and the picture seemed somewhat jerky at times. Colors varied, also due to the film stock. Some shots demonstrated nicely vivid and broad tones that looked appropriately dynamic and tight. However, others – usually interior scenes – could be somewhat drab and faded in appearance. Black levels seemed similarly erratic. Dark tones usually were reasonably deep and dense, but they also could be a bit pale and flat. Low-light shots tended to appear moderately thick and overly dark, but they didn’t seem terribly problematic in that regard. Really, El Mariachi looked better than I expected given its roots, but the overall image still seemed too flawed to merit a grade above a “C+”. One note about the image: the DVD case claims this is a “new transfer from original negatives supervised by Robert Rodriguez”. I never saw prior editions, so I couldn’t compare them. However, when I scanned reviews of those other discs, it sounded like this one improved upon them. I can’t offer a firm endorsement, but it does appear that this transfer really is new. The film’s Dolby Surround 2.0 soundtrack fared better than the visuals. 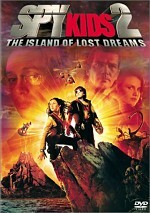 The film came presented in the original Spanish; no English dub appeared, though oddly the DVD included a French rendition. The soundfield didn’t dazzle me, but it seemed appropriately engaging. Music showed nice stereo imaging and the effects helped create a modest but useful sense of atmosphere. Much of the audio remained pretty centered, but a mix of elements popped up in the side speakers, and they meshed together reasonably well. The action scenes offered the liveliest sequences, though quieter bits seemed pretty convincing as well. Surround activity mostly limited itself to general reinforcement of the environmental audio; the rear speakers didn’t add a whole lot to the presentation, though they broadened it somewhat. Audio quality seemed positive from start to finish. Speech sounded natural and lacked any issues connected to intelligibility or other flaws. Music was warm and dynamic, as the guitar-based score presented crisp highs and warm lows. Effects came across as accurate and tight. They didn’t show any distortion as they captured the original elements well. Bass response was deep and rich but didn’t display any concerns related to looseness or boominess. Overall, the soundtrack of El Mariachi impressed me. We get a small set of supplements, mostly taken from a prior laserdisc release of El Mariachi. We open with an audio commentary from director Robert Rodriguez, who offers a running, screen-specific piece. As I previously experienced with Rodriguez’s discussion of Spy Kids 2, the director can be a very chatty participant, and here he gives us a nice look at the creation of his film. Note that although Rodriguez mentions an English dub of Mariachi that we should be able to access, none appears on this disc. I assume this is an artifact of the original laserdisc edition for which he recorded the track. Heck, Rodriguez even mentions this as being a laserdisc at one point. Someone alert the false advertising folks: the DVD’s Ten-Minute Film School actually runs 14 minutes and 37 seconds! It packs scads of information into that span, as we get a great look at how Rodriguez shot Mariachi on the cheap. He narrates the program as we watch raw film footage, a few behind the scenes shots, and finished clips. Rodriguez touches on many techniques he utilized during the production. He already chatted about more than a few of these in his commentary, but the fact we can watch them as well makes “School” more valuable. It’s a briskly paced and very informative piece. Finally, El Mariachi tosses in some promotional materials. We get a Sneak Peek for Rodriguez’s upcoming Once Upon a Time In Mexico. This gives us a four-minute and 27-second featurette that mostly combines shots from the set and soundbites from actors Antonio Banderas, Johnny Depp, Salma Hayek, Danny Trejo, Cheech Marin, Willem Dafoe, Eva Mendes, Marco Leonardi, Julio Mechoso, and Enrique Iglesias. It’s not a deep program, but the glimpses behind the scenes aren’t bad. In addition, we find trailers for Mexico, El Mariachi, Desperado, The Mask of Zorro and Love and a Bullet. Shot for about half the price of a Civic, El Mariachi rarely totally overcomes its budgetary restraints. However, the movie usually surpasses expectations and actually allows us to forget its amateurish roots. It seems lively and exciting and remains much more entertaining than most blockbusters. The DVD presents decent picture plus surprisingly positive audio and some very nice extras highlighted by an excellent audio commentary. El Mariachi provides a memorable ride, and I definitely recommend this DVD.